West coast based Charles Perry is an artist that some Northern fans know for his beautifully rendered big city ballad “Move On Love” but if you delve a little deeper into his recording career there are other sides worth listening to as well. I’ll Walk Through The Darkness bridges the gap between doo-wop and soul, with Perry’s high baritone swooping and soaring over the stop-go rhythm. Love that falsetto burst at the end too. But It Doesn’t Matter Anymore is a much more serious proposition altogether. No female chorus to get in the way of some really high quality gospel based vocals from the man. The arrangement is low key as well – just a small rhythm section - and that simply emphasises just how well Perry gets his message across – and how much the song’s title is at variance with his real feelings. "Charles Perry who cut the Melic tracks was formerly lead singer with an LA group called The Creators. Here is a cut from 1961 that feature him. He wrote the side. The record sold well in parts of LA and Perry was lured away to be managed by talent agent Jesse Mae Robinson. Perry then joined the Melic organisation and cut ‘I’ll walk through the darkness’ & the flip ‘If there wasn’t any you’ that featured an early version of the Blossoms (Darlene Wright (Love), Gloria Jones, and Fanita Barrett) on background vocals. (1961/62 I think - 1963 is too late). 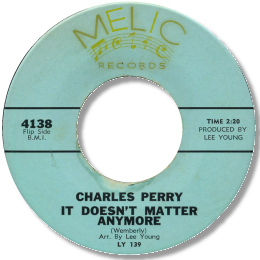 Neither ‘darkness’ or the follow up Melic 45 ‘It doesn’t matter anymore’ were commercial successes and consequently Charles Perry returned to The Creators late 1962 and recorded two 45s for Dore including ‘Too far to turn around’ which you listen to here..
After he cut ‘How Can I (keep from crying)’ in 1965 with Joe Jefferson producing (the same Joe Jefferson with numerous writing and producing credits in the 70s?) the trail goes cold." As ever I'm really grateful to Greg for his first class sleuthing. Note: The Mutt & Jeff 45 is considerably shorter than the Melic/MGM releases.